It contributes s 15% of India's and 98% of Telangana’ s exports in IT-ITeS sectors. The city is home to more than 1300 IT/ITeS firms, including global conglomerates such as Microsoft, Apple, Amazon, Google, IBM, Yahoo!, Oracle, Dell, Facebook and major Indian firms including Tech Mahindra, Infosys, Tata Consultancy Services (TCS), Polaris and Wipro. 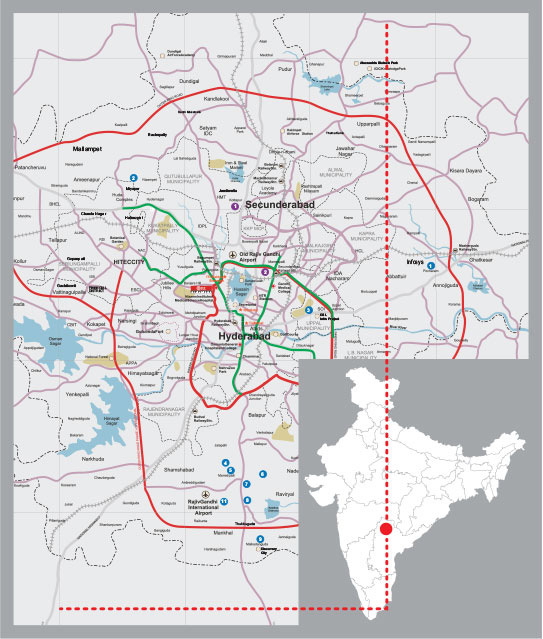 Hyderabad office market is divided into five submarkets housing one Central Business District, one Secondary Business District, one Suburban submarket with Gachibowli and Hitec city. CBD is an established social infrastructure with huge premium residential catchments. SBD’s are typically where higher asset quality is available as compared to other sub-markets as well as availability of commercial stock. PBD’s are where there is availability of large floor plates and relatively affordable rents, at high-quality buildings, for IT/ITeS occupiers. Hyderabad has been characterised by low supply during the earlier Telangana unrest and has started showing growth momentum in recent times. Vacancy has risen over the past three years or so, but remains low at just 9% currently. 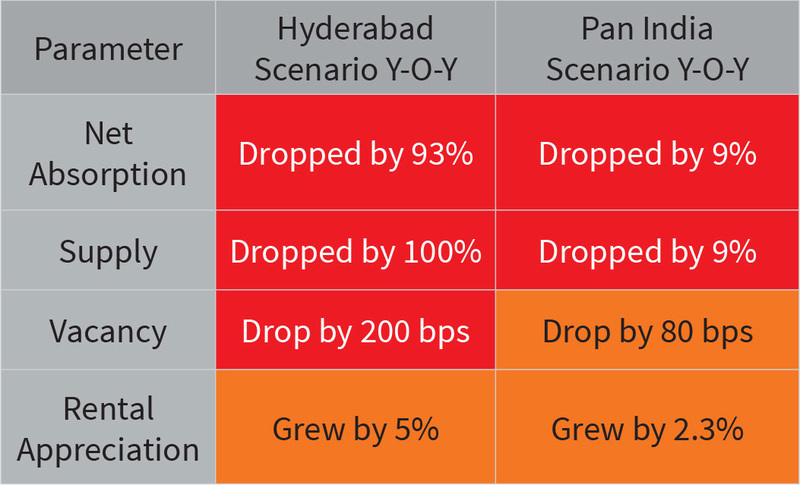 With office occupiers considering expansion and new entrants seen entering the market with office space requirements in IT dominant cities like Hyderabad, vacancy levels are likely to show a notable 390 bps drop by 2020 from current levels. The market is expected to see a steady supply until 2020, however, most grade A stocks have witnessed good activity leading to pre-commitments. Supply expected between 2017 and 2020 is 19.26 million sq. ft. including “on hold” and proposed projects. 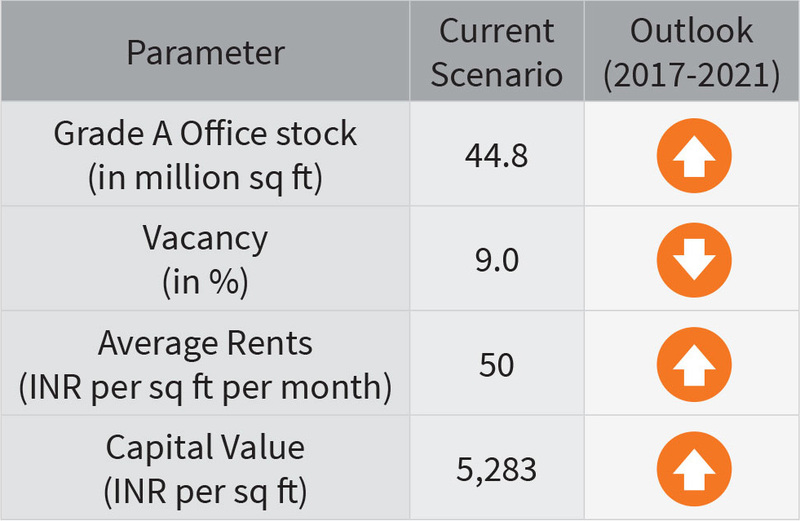 Majority of the upcoming supply that is going to come up over the next five years is relevant in terms of its location and quality, thereby creating the right value proposition for tenants by meeting their business needs. The high pre-commitment levels in such projects reflect this. As the Hyderabad office market is showing continued signs of demand, developers are sensing that there are opportunities for office space development over the medium-to-long-term horizon.